An 11-year-old boy rescued by Childline volunteers and child protection officials in Chennai last week has led them to a suspected child trafficking issue in a madrasa. 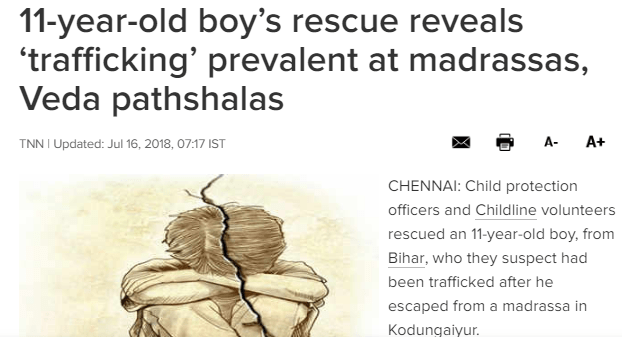 According to a report in the Times of India, the boy was rescued by officials on Wednesday and was produced before the Child Welfare Committee on Saturday. The boy was reportedly found near Avadi railway station and was only able to tell that he was living in a madrasa. Later, as per the report, the officials were led to madrasa Usman Bin Affan in Kodungaiyur through a paper in the child’s pocket. Upon inquiry, though the teachers at the madrasa admitted that the child lived there, they had no documentation or records to show his admission or parental contact. The report also states that none of the staff at the madrasa had any identity cards. The madrasa reportedly houses about 60 children from impoverished families in Bihar, Odisha, Assam and West Bengal. As per the report, the child later provided information about his family in Deolia, Bihar and his family was contacted by the officials. The child was later handed over to his brother after due verification of documents. Interesting thing is that though the headline of the article mentions Veda Pathshalas being suspected of child trafficking, the report has no details of any such incident. There are no cases mentioned where any Veda Pathshala was found involved in child trafficking or any child trafficking case being traced back to a Veda Pathshala. One Twitter user Ethirajan Srinivasan pointed the fact out. The news report in Times of India, written by a reported Ekatha Ann John, mentions the term Veda Pathshala only once in the report, “Since January, Railway Childline, Government Railway Police and the DCPU have rescued at least 25 children from Chennai who escaped from Madarsas and Veda Pathshalas located in the city and other districts.” But the article has no mention of specific cases or names of any Veda Pathshala. It raises the question, in a report where a possibly trafficked child was traced back to a madrasa, was the term ‘Veda Pathshala’ force-fitted to balance things out? With no details of any children being trafficked in Veda Pathshalas or any case of trafficked children being traced to any such institution, was the headline just a deliberate balancing act?